"Hand-wrapped" look with Wrap King - Wrap King automated hand wrapped look. C & K MACHINE COMPANY INC.
Packaging produced by the various models of Wrap King ® simulate the look and feel of a product wrapped by hand, however The Wrap King ® can do it better and much faster…...Up to 200 pieces a minute. See our new pleat wrapper in operation wrapping chocolate discs. If you’re interested in having your product look and feel as if it has been individually hand wrapped, but the cost of actual hand wrapping is prohibitive then the Wrap King ® is the machine for you. The Wrap King ® can handle products from 15/16” in diameter up to 14” in diameter with capabilities of handling nearly every type of wrapping film such as foil, paper or polypropylene. Our optional film feeding mechanism even allows a customer to use such films as Saran® Wrap and polypropylene materials. The Wrap King ® is one of the very few machines that can wrap with Saran® Wrap. 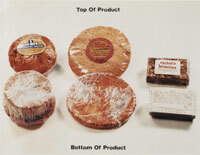 Contact Us today and let C & K help you with your special packaging project. 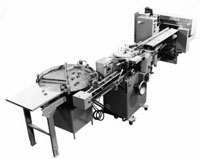 Wrap King® Automax, ball bearing wrapping cartoning combination. Wrap King® Modal DW-S with auto feed.